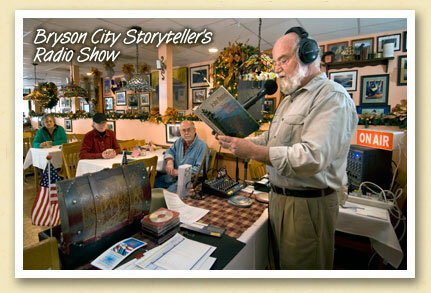 Each Saturday, Tim “The Storyteller” Hall broadcasts his 9 AM radio show live from The Station Restaurant in downtown Bryson City. Above, Tim reads one of writer John Parris’ classic tales of Appalachia while diners enjoy their bacon and eggs. The show “Crossroads The Radio Program” is broadcast locally on WBHN 1590 AM and simulcast worldwide on Live365.com. Tim, who is currently renovating Bryson City’s historic Citizens Bank Building for The Storytelling Center of the Southern Appalachians at Bryson City, will broadcast a special edition of “Crossroads” during the town’s annual Christmas Parade at 1:30 PM on December 6. After the parade, there’ll be storytelling and singing on the porch of the Calhoun House on Everett Street until 7 PM when the town’s annual Spirit of Christmas event begins. Founded by Clark Whittier in 1885, the town of Whittier, North Carolina once flourished as a lumber center before succumbing to the Great Depression. No longer incorporated, the quiet little community on the banks of the Tuckaseigee river is mostly residential. If you’d like a glimpse of the original Whittier, stop by Gloria Nolan’s “Stuff’ & Such” consignment shop across from the Whittier Post Office. 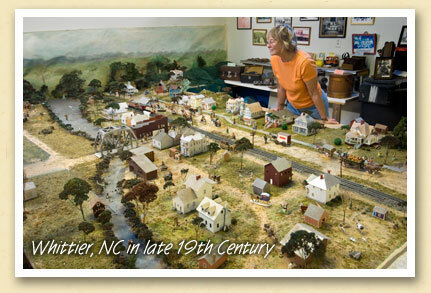 Working from old photos, Gloria has created a scale model of Whittier as it was in 1895. Above, Whittier resident Ann Hill studies the model, imagining her Smoky Mountains community the way it used to be. It’s a free show and club members enjoy an audience. Since the Great Smoky Mountains National Park’s earliest days, visitors have shared the wonder and beauty of the Smokies with their friends via postcards. 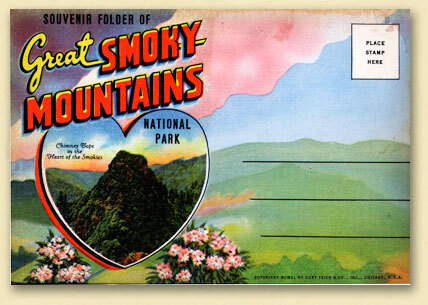 And now that the internet has made “snail mail” somewhat passe, we’ve decided to publish a whole new collection of Smoky Mountains postcards via this blog. 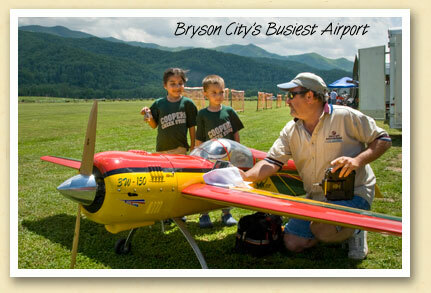 Our ePostcards will illustrate all the great things that contribute to the Smoky Mountains experience. And like the traditional postcard, our “Postcards From The Smokies” will be mostly photographic, with just a few words. A quick read. We plan on publishing a new postcard every week or so.